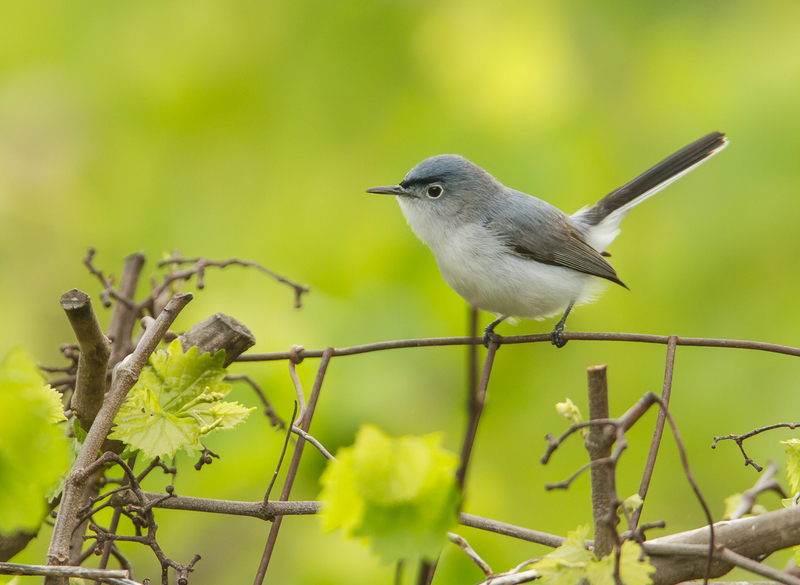 I once knew a [beginner} bird-watcher who, not aware that altricial species attain full body size before leaving the nest, spoke seriously of the gnatcatcher as a tiny mockingbird. Indeed, I often describe these active birds as looking and behaving like a tiny mockingbird. They are always fun to watch as they hop through the branches, or hover beneath one, snatching an insect meal. And their small size, white eye ring, blue-gray coloration, and exaggerated tail, make them easy to identify. They seem to be in constant motion, especially that noticeably long tail. In the writings on this bird in Bent’s Life Histories, Francis Marion Weston describes it like this…Certainly the most expressive feature of the gnatcatcher: as of its larger counterpart, the mockingbird: is its long, ever-active tail; now up and down, now from side to side, it is never for an instant at rest. This is a fairly common species throughout much of North Carolina in spring and summer, with occasional winter stragglers in this area. You usually have a better chance of seeing a few in winter in the Coastal Plain. But most migrate to Mexico or Central America for the colder months before returning in March and April. A pair has been active for a week or more in the garden area, gathering nesting material, including fine grasses and some dog hair I placed in a hanging basket on a tree branch for use by local nesters Their nests are beautiful examples of avian architecture, resembling a larger version of the delicate lichen and spider silk construction of the Ruby-throated Hummingbird. Male singing. Note the dark forehead and line over the eye. And I agree with Weston’s assessment of the field marks used to separate the sexes on this diminutive songster… The distinguishing mark of the male gnatcatcher in breeding plumage: the black forehead and line over the eye : is useful as a field mark only at very short distances. Luckily, this guy perched along the fence for a couple of minutes so I could study him in detail as he sang his heart out. I’ll be on the lookout for their comings and goings in the garden the next couple of weeks, hoping to spot their beautiful nest somewhere in my woods. 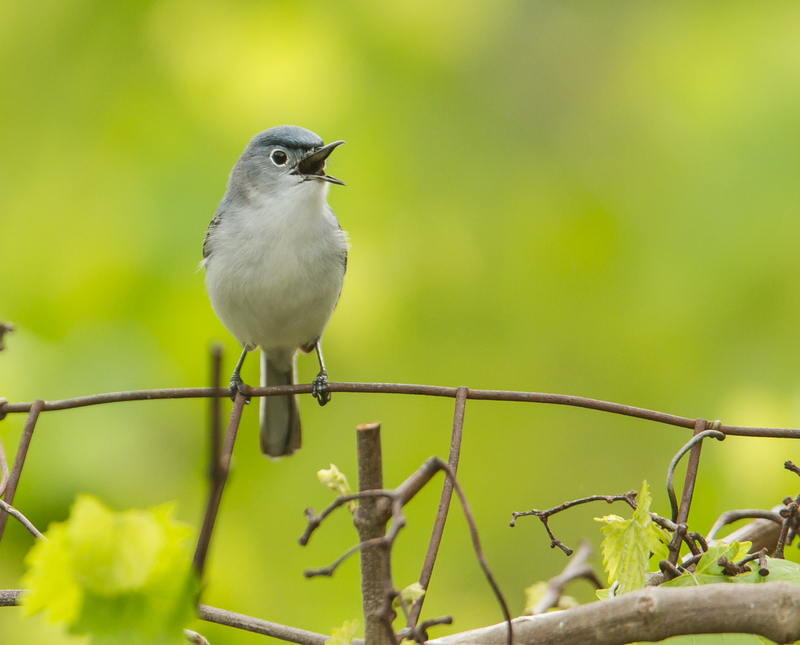 This entry was posted in Natural History and tagged blue-gray gnatcatcher by roadsendnaturalist. Bookmark the permalink. Looks like he might have the personality of a mocking bird.